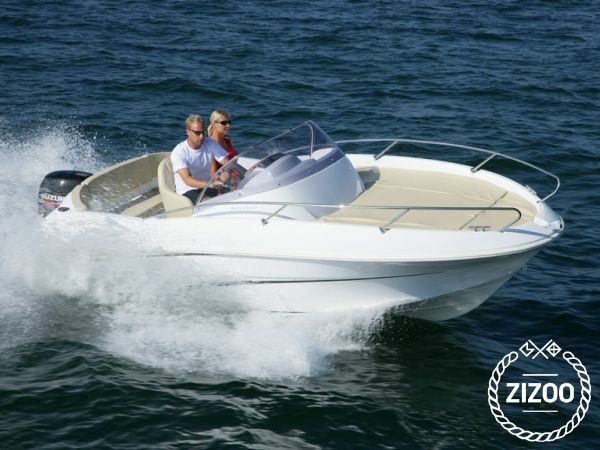 When searching for an ideal boat to take your family for a day trip to check out some other beaches, Benetau Flyer 500 Open is the perfect choice. Primarily due to the front deck which can be folded to turn into a sundeck safe for children. All seating surfaces are covered with comfortable cushions and the cabin features a small table where you can serve snacks at lunch time. If you're holidaying with mates, she can take up to 6 people, and has plenty of storage for your refreshments and equipment - she is ideal for fishing. So drop the ladies off at Baska beach for a couple of hours, to catch some tan and swim in the turquoise sea, while you take her out to try your luck - you might even catch your dinner! Your charter company staff will know the best places to do that, so don't hesitate to ask for a tip or two. Requested 54 times this week!